…in fact pretty much everywhere. But strangely, they are pains I can derive some satisfaction from as it means that this place can finally be called a vineyard. 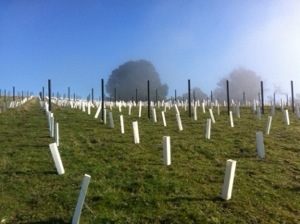 A third of the vines are in and going strong. This entry was posted in Tasmania, vineyard, Wine and tagged Rasmanian Sparkling Vineyards. Bookmark the permalink.